Australia have called up two relative unknowns for the Third Test against South Africa in Sydney. Firstly, there’s Doug Bollinger, the NSW left-arm quick with Russian hair who has the potential to become involved in the most champagne puns since Dominic Cork. Bollinger has already delighted fans and opposing captains alike with his promise to give a logically preposterous 150,00% in his debut, suggesting that whatever standard he attains in the match, his usual top performance is only 0.067% as good. 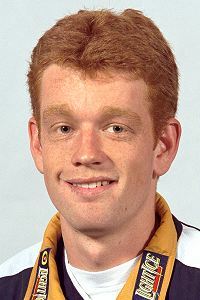 Secondly, there’s the markedly less hilarious Andrew McDonald, who shares a name with an NHL player as well as a character from Coronation Street and looks like a cross between Ron Howard and Matt Damon. I’m sure they’re both fine cricketers, but they’re hardly going to inspire terror in the hearts of South Africa’s batsmen on a par with the Australian bowling attack of yore. Dominic Cork‘s first class cricket career seems to be almost over, as he has not been offered a contract for next year by Lancashire. Dominic Cork has suggested dropping Michael Vaughan. At the moment, Vaughan’s captaincy skills are keeping him in the side, but how bad a captain can you be if you have Ryan Sidebottom taking 7-47?